Flash defaults to tiling a bitmap fill. Tiling is simply when an image is repeated in a grid until it fills the entire object. If you have applied a bitmap fill to a vector object, you can continue to edit its characteristics and placement. 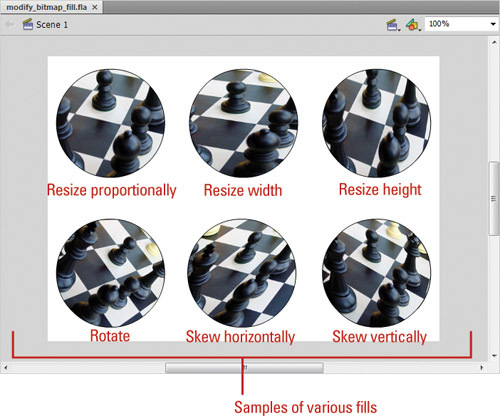 You can resize, skew, or rotate the fill or change its center point within the shape with the Gradient Transform tool. 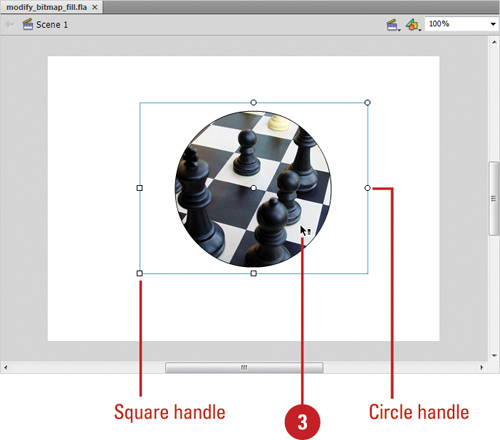 This tool allows you to dynamically make these changes when it is applied to any editable shape. As with most of the assets Flash stores in the Library, any change you make to the application of the fill does not affect the master object stored in the Library. In this way, bitmaps like video clips and sounds, behave similarly to symbols in that their master object is not affected. Although when you use a bitmap in your movie Flash refers to this as a copy, not an instance, because there are no built-in controls for bitmaps. 1. Create a shape on the Stage with a bitmap fill. 2. Click the Gradient Transform tool on the Tools panel. The pointer changes to an arrow with a small gradient box in the right-hand corner. Press F to quickly select the Gradient Transform tool. 3. Click the shape to select it. A bounding box appears on the tile. 4. 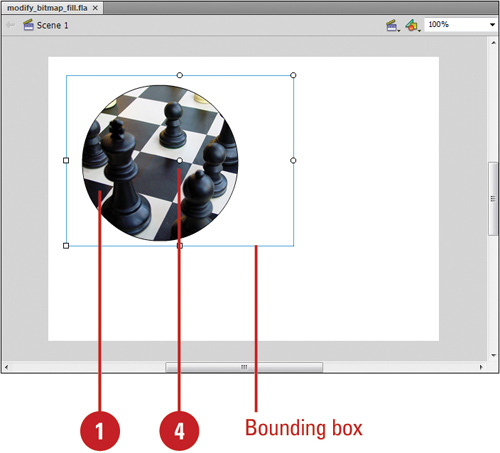 Position the pointer over the white circle in the center of the bounding box. The cursor becomes a Move icon. 5. 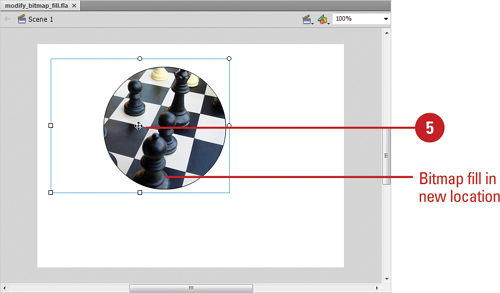 Click and drag the center point to a new position. The tile accommodates to the new position of the center point. 3. Position the pointer over the shape, and then select it. Bottom-left-corner square. Drag this to resize the fill proportionally. Left-center square. Drag this to resize width of fill. Bottom-center square. Drag this to resize height of fill. Top-right-corner circle. Drag this to rotate fill. Top-center circle. Drag this to skew fill horizontally. Right-center circle. Drag this to skew fill vertically.